The new accusations against China made by the United States in the update of the Section 301 investigation disregard the facts and are totally unacceptable, China's Ministry of Commerce (MOC) said Thursday. 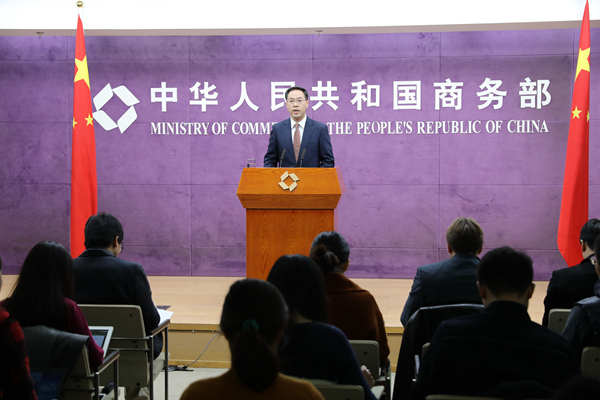 "China is deeply concerned with the new accusations, and urges the U.S. side to stop making statements or moves that are destructive to bilateral economic and trade ties," MOC spokesperson Gao Feng said at a press conference. The Office of the United States Trade Representative recently released a report updating information on its Section 301 investigation, which included new blame on China's technology transfer, intellectual property and innovation policies. Gao said China had reiterated that the investigation as well as related trade measures were unilateral, trade protectionist practices taken by the U.S. according to its domestic laws. "By putting domestic laws above international laws, the United States has broken its commitment to all members of the World Trade Organization and has disregarded and damaged multilateral rules of the World Trade Organization," he said. He urged the U.S. side to "take a constructive attitude to bring bilateral economic and trade ties back on the right track and create favorable conditions for stable growth of the global economy." "Teams of the two sides are in close contact to push the implementation of the consensus reached by the presidents of the two nations," Gao said. Gao also said that "China was assessing the potential impact from a U.S. proposal to increase control over technology exports, and will take necessary measures according to the situation and safeguard legitimate rights and interests of Chinese businesses." "To erect unnecessary barriers for normal international trade by generalizing the concept of security will neither enhance national security nor promote balanced trade growth," Gao said. He urged the United States to take constructive measures to improve the trade environment, and create conditions for increasing exports of its competitive products and narrowing the trade deficit.